Hi there! I want convert psd to jpeg, thus use "export as" menu. But it doesn't save guides. So, question is - how convert psd to image keeping guides? You can not keep the guides when converting to any of the 'export' formats png, jpeg, tiff... These are flattened 'final-for-use' images. psd and gimp .xcf are 'working' formats that can retain more than just the image. 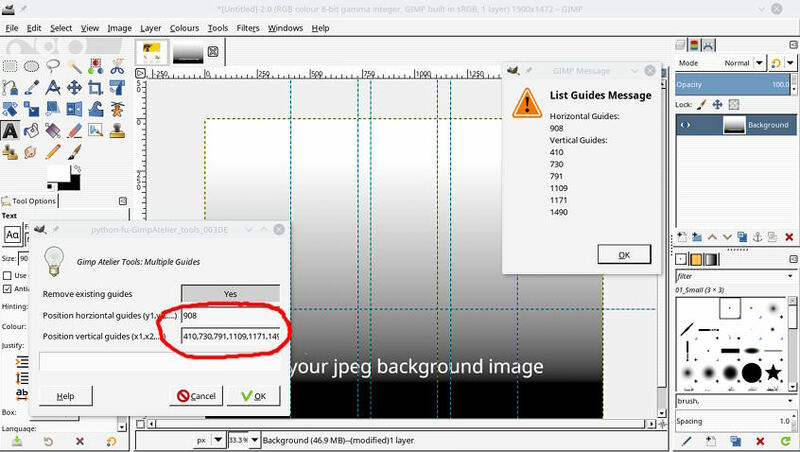 Save your work in Gimp xcf format. This saves layers, guides, grid settings, active selections and channels. When complete then export to a jpeg. Unfortunately, nothing happens Maybe, i'm doing something wrong? "Unfortunately, nothing happens" will need some more info for us to understand what is not happening. 1) You have a file layout.psd. 2) You open this file in Gimp. Are there any guides now? This file won't have any guides. What is not happening? Where are things going wrong? (11-01-2018, 11:44 AM)sandbox4013 Wrote: Unfortunately, nothing happens Maybe, i'm doing something wrong? Read the earlier post again. You can not save the guides in jpeg format. 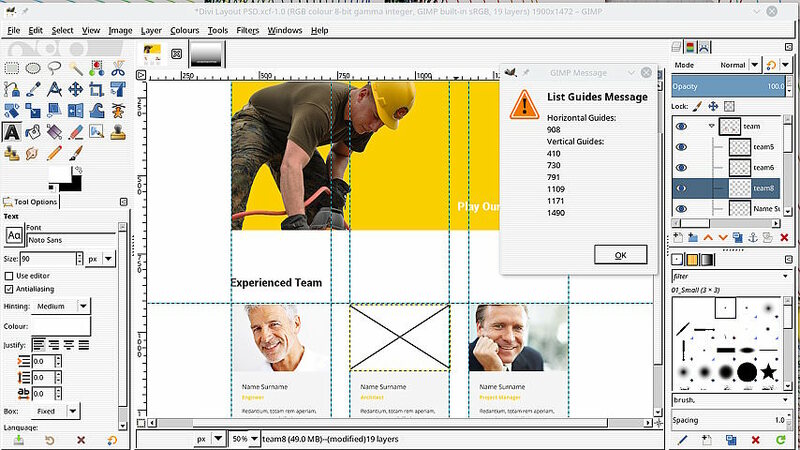 The guides do not exist outside of application, in this case Gimp. They are virtual, are not incorporated in the image. These .psd files are 'templates' lots of layers, masks and of course those guides. The same when you open the psd in Gimp. You get the layers and guides some other information (but not all). "Maybe you can explain why you want the guides showing in a jpeg. " I want use image for pixel perfect chrome extension. It places image at web page, so i can align layout. With guides it'll be more accurate. It's gimp's guides. Default, which i can turn on/off i.e. ctrl-shift-t.
(11-01-2018, 03:43 PM)sandbox4013 Wrote: ...I want use image for pixel perfect chrome extension. It places image at web page, so i can align layout. I do not really see how Gimp fits in with a web browser extension. 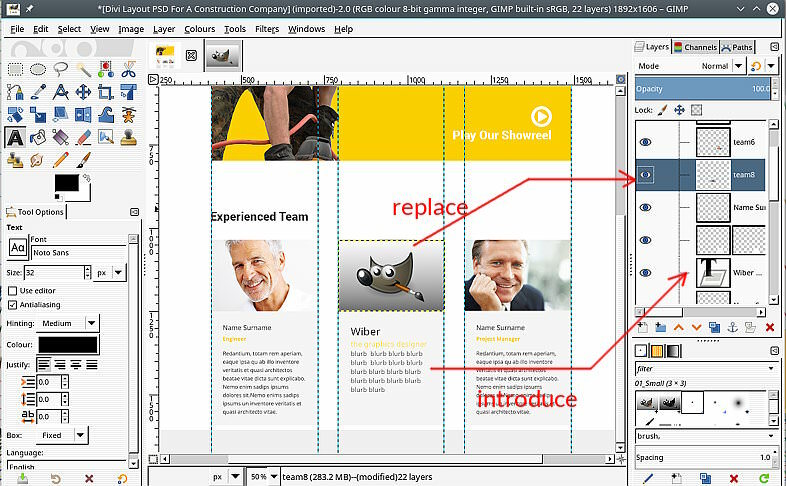 The sort of PS .psd template image in your example is used by replacing / editing or adding layers. Some layers/layer groups might be made non-visible. At the end when you have what you want you can export as a single layer, (flattened) jpeg. Keep that info window open and switch to your jpeg image. Open GAT tools Tools -> Gimp-Atelier and enter the list of Guides. Ok that and the guides are added to your image. As before, these only exist inside Gimp, Save as a .xcf to keep them, export and you lose them.